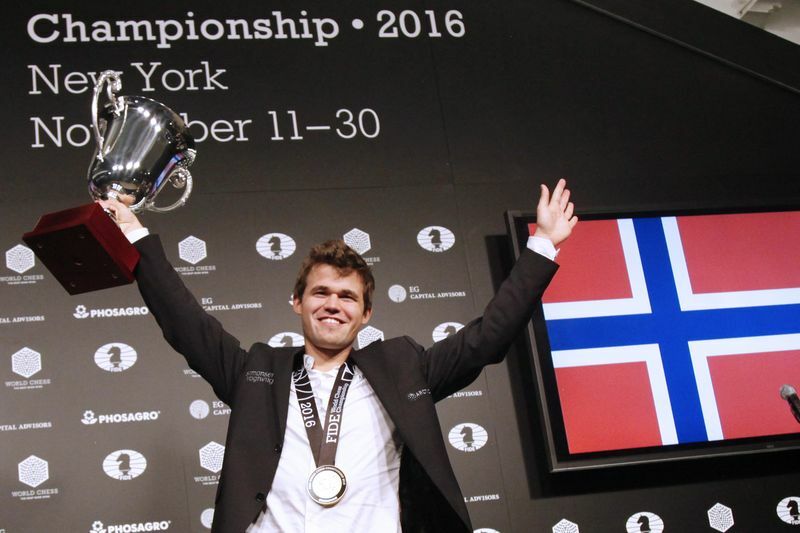 Magnus Carlsen has won the World Chess Championship for a third time after unleashing a glorious queen sacrifice on the final move of the match. That meant the birthday boy had won the tiebreaks 3:1, after also winning Game 3. Sergey Karjakin reminded us what he was made of with a stunning escape in the second game, but he was always on the back foot and admitted he was “completely not ready to play rapid games”. Relive the action and watch a final recap from the one and only Peter Svidler. I felt that it was an advantage for me that I didn’t really have to think so much about Game 12 and he did. Also I felt my head was working better than it was a few days ago and also he was perhaps playing a bit worse, so in that sense I thought playing four games instead of one seemed like a very good idea. Besides, it was very refreshing to play a bit faster after all these weeks! I spent a lot of time to prepare to Magnus but it didn’t really work and he was jumping to different openings and I didn’t really use my preparation. I can admit a few times I completely forgot my preparation and I mixed up my preparation - in the classical games, but also in the rapid. There were so many things to prepare that I didn’t manage to remember everything. Maybe it was better to have a fresh head and not to repeat so much. It was by no means winning, but after his heroic attack in the previous game Karjakin allowed the black pieces to gang up on the 2nd rank and then blundered with the pseudo-active 38.Rxc7?? 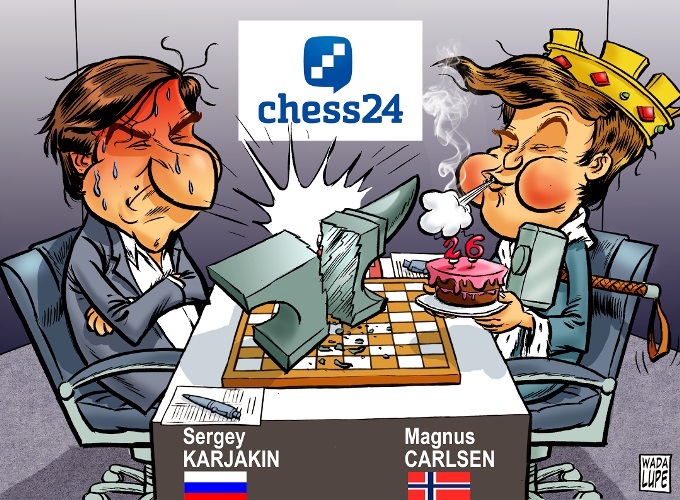 Karjakin did what players usually do in this situation and played the Sicilian, but Carlsen set up the famous Maroczy bind with pawns on c4 and e4. To break down that wall Sergey had no choice but to take some objectively dubious decisions and, for a while, he did a reasonable job of creating a world in which his dreams could still come true. Caissa had chosen her favourite already, though, and the hundreds of thousands of chess fans tuning in across the world got to witness a moment of chess history. The best way to relive the conclusion of the game is perhaps from the moment our commentators Jan and Peter spotted a fantastic possibility for White. Would Magnus go for it, despite having much simpler winning options? The answer, of course, was the most resounding yes you could imagine! Those last two words were interrupted by a very long and loud round of applause, since Sergey’s whole approach to the match both on the board and in the post-game press conferences has won him fans far beyond Russia. I’m very happy that at the end of the match I managed to find joy in playing. Today, I have to say, it was fun to play. To some extent I think that is the most important thing. I was in kind of a dark place at some point in this match but I feel that now it’s better, so I’m looking with confidence at the future. It was very tough after Game 8. Before that even though it was frustrating not to win some better positions I still thought that I was going to win, but after Game 8 I had all sorts of negative thoughts in my head and it was very difficult to settle down and play normally. I tried not to think about it but that wasn’t so easy. I think there’s a cliché in sports that you always need to focus on the process instead of results and that became very difficult during those few days, but I think in the 10th game at least to some extent I managed to stay calm when I needed to. Of course it was a very important moment when I didn’t realise that Nxf2 in the game that I lost was drawing immediately, and that was probably the most critical moment of the match. Still, I don’t want to say that Magnus was lucky, because he was basically winning in games 3 and 4, so it could turn in different ways. It happened as it should have happened. I will try to improve my play. Sergey vowed to be back, while by the next time he has to defend his title in 2018 Magnus will have held on to the crown for 5 years. We hope you had a wonderful time following the match here on chess24 and apologise for a few hiccups at the start of our final broadcast. Stick around for the chess action coming up in the weeks and months ahead – the big one on the horizon now is the London Chess Classic, the final stage of the 2016 Grand Chess Tour. It doesn’t have Sergey or Magnus, but it starts in just over a week and has every other player in the Top 10! Carlsen: "I'll try to punch him until he finally knocks over"
Game 5: Magnus "screws up"
Game 10: Magnus is back! Game 12: Tiebreaks it is!